Advanced Edge Care Kit - Everything you need to professionally sharpen ski and snowboard edges. Side edge bevel multi tool with stainless steel rollers that includes a Swiss-made ICECUT metal file and three Swix diamond stones and a deburring gummi stone. All items purchased separately add up to $132. High quality Swiss-made ICECUT metal file included (80 mm). Four steel roller bearings allow easy slide along base to protect it from edge filings. Adjustable precision side edge angles from 85-90 degrees in 1 deg increments. Accepts steel files, diamond files and stones 6 mm in thickness. Bonus Benefit for this tool: If you don't know what side angle your ski/board is set to, this tool can help you find them. Before you start mark the side edge with a sharpie, start the tool at the lowest angle and see if it removes the marking on your edge. Raise the angle step-wise and repeat until it removes the mark. That is your angle! Record the angle for future reference. 200, 400, and 600 grit stone for deburring, sharpening, honing, polishing ski and snowboard edges. One Gumi or Gummi Stone, may be gray or red, for prepping an edge, deburring as the final step in edge sharpening, or detuning. Also great for edge rust removal. Routine sharpening is done from the side edge only. A base edge bevel is not included. Base work is less frequent and typically only at one angle (1 degree). A single angle tool at the angle of your choice would be a good compliment to this kit. Everything you need to professionally sharpen ski and snowboard edges. Side edge bevel multi tool with stainless steel rollers that includes a Swiss-made ICECUT metal file and three Swix diamond stones and a deburring gummi stone. All items purchased separately add up to $132. 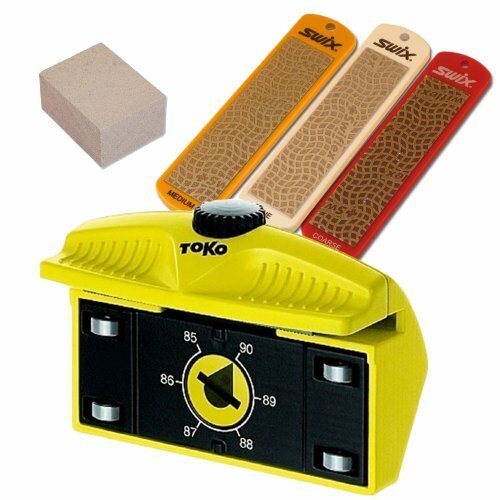 Toko Adjustable Side Edge File Beveler with Steel Rollers; High quality Swiss-made ICECUT included (80 mm); Four steel roller bearings allow easy slide along base to protect it from edge filings; Adjustable precision side edge angles from 85-90 degrees in 1 deg increments; Accepts steel files, diamond files and stones 6 mm in thickness. All 3 Grits Swix Diamond Stones TA200E, Medium TA400E, Fine TA600E; 200, 400, and 600 grit stone for deburring, sharpening, honing, polishing ski and snowboard edges; Stones are 100 mm long. One Gumi or Gummi Stone for prepping an edge, deburring as the final step in edge sharpening, or detuning. May be gray or red. If you have any questions about this product by RaceWax, contact us by completing and submitting the form below. If you are looking for a specif part number, please include it with your message.